The oak supplied by Orlestone Oak Sawmill is European Oak, English Oak, Quercus Robur either Pedunculate or Sessile. If the timber supplied is of other species this will be made clear at the time of ordering. European oak, being a natural material is subject to certain irregularities and properties of a not concise nature. Although the dimensions are given in a very exact manner, the natural grain of oak timber can cause slight variations in cross section which are uncontrollable in the sawing process. Green oak timbers dry and shrink from the outside inwards. This will result in cracking and checking of the outer surface as the timber shrinks and dries. We advise traditional joints are used to allow for the movement. European oak reacts to changes of humidity by expanding and contracting. Oak exposed to the atmosphere dries to a silver grey colour. Although oak is largely impermeable, recommended stains and polishes are available to protect the surface. Some sections contain a percentage of sap wood. If no sap is wanted in the beams it must be stated at the time of ordering. There will be extra costs in supplying sap-free beams. Although we state standard sizes, all products are bespoke and machined to order. Should any of our bespoke products be cancelled or rejected after cutting, we reserve the right to charge a re-stock fee if, in our opinion, we believe the goods to be of a suitable standard. Due to the open site at Orlestone Oak Sawmill, we will not take reasonability for goods stored externally waiting for collection/delivery after a three month period. Ferrous metals have a natural reaction with the tannin in oak turning the timber black. We recommend the use of stainless steel. While still green, some insect attack can take place but the timber will dry and become resistant to attack. We would recommend that all green oak beams should be treated with a suitable insecticide for the controlling of woodboring insects. Unless stated joinery is supplied unfinished (no oils and paints) with no glass or ironmongery, but all can be priced if required as separate items. We have found that on the ordering of the glass it is better to be purchased direct by the customer so they hold the guarantee. Photographs on this website are for illustration purposes only and can alter slightly as no two planks are alike. At Orlestone Oak we endeavour to produce quality air dried beams. Sections sizes vary and the beam, if in stock, can be undersized, so when ordering you will need to state if you need an exact size. When ordering and the end user is machining (PAR) 10mm should be added on both dimensions (thickness and width) and allow 100mm on the length. We do not cut beams to an exact length but can offer a price to do so if asked. We can not always have an exact size beam in stock so we cut the beams for resizing there can be some colour differences due to exposing a new face (especially evident on samples), this can happen on just one face or all four faces. As the timber dries it produces drying splits and some raised knots, this is normal in the air dried grade. We will grade timber and put into orders what we feel is acceptable. Information provided at the time of ordering will be taken on board by our graders. Knots are often present and can shrink or be loose in the timber, this can make them drop out or dislodge when being re-sawn. Some edges may contain a waney edge. If ordering and the end product is going to be used in the production of joinery items such as windows, door frames and gates also decking handrails/spindles etc we can produce but will be cut out of a joinery air dried quality oak, this comes out of large slabs of oak and gives the sawmill a higher wastage factor. The moisture content varies greatly in the timber due to section sizes and age of oak. Beams are always produced with a sawn finish, there can be dark blue marks left on the timber caused by reaction between the tannins and any steel it comes in contact with. If only sawn there can be some water marks. We can offer a planned or sand blasted finish which will uniform the overall finish. We also sell wood bleaches specifically to remove these marks. We will supply the best quality boards we have at the time of ordering. Lengths and widths are random but we do try to supply boards in one length for ease of laying. Lengths may sometimes be shorter than the stated 2 metres, when knots and blemishes are cut out to ensure the qualities required for particular grades of flooring. Because of the nature of oak when milling the boards, some splits can appear. There is a certain percentage of knots in our boards. There is an element of waste when laying oak boards and we recommend you allow this when ordering because there can be differences in milling sizes when separate orders are placed. When possible, flooring should be left in the area of laying to acclimatise. Some shrinkage will occur after laying as the flooring settles with the surroundings. The movement of oak is out of our hands and should be taken into consideration when using this product. Floor joists should be treated with a suitable woodworm killer if any infestation looks evident. Photographs of flooring shown on this website are for illustration purposes only and can alter slightly, as no two planks are alike. Recommended moisture content in flooring 8-10%, maximum RH within installation area 75%. After installing the underfloor heating, the heating must run a minimum of 21 days. Still run underfloor heating if wood base sub floor. Always use acrylic latex compounds for levelling of cement based sub floors. Recommended minimum of 4 days acclimatisation period, the flooring should be stacked in piles of 10-15m2 or insert bearers between levels of flooring to allow for air circulation at ambient room temperature. Rooms need to be water tight and not open to any elements. Underfloor heating should be turned off 48 hours before installation begins. Important –24 hours AFTER completing installation underfloor heating must be turned on to the lowest temperature, rising to a maximum temperature of 27 degrees centigrade over a 7-day period at point of contact between the flooring and the subfloor. During cold periods a room thermostat cannot be relied upon to maintain accurate control of the maximum floor temperature. Also advise client not to move temperature more than 3o in any 24-hour period. Underfloor heating should run continuously and not be turned off. This floor is suitable as a structural floor. We guarantee the flooring against delamination as long as all guidelines are adhered to. Flooring supplied in widths over 250mm wide will be a mixture of our character and rustic grade flooring unless otherwise specified. Please note that in the production of sleepers there is not normally any provision for parallel ends. This can be added but will incur additional costs. Our logs come from the sides of our beam production. There can be some smaller sections in a load as it is very hard to separate during the manufacturing process. There can also be some uniform shapes delivered in with the logs supplied. Sizes and costs of firewood are based on tipped volume and not stacked volume. 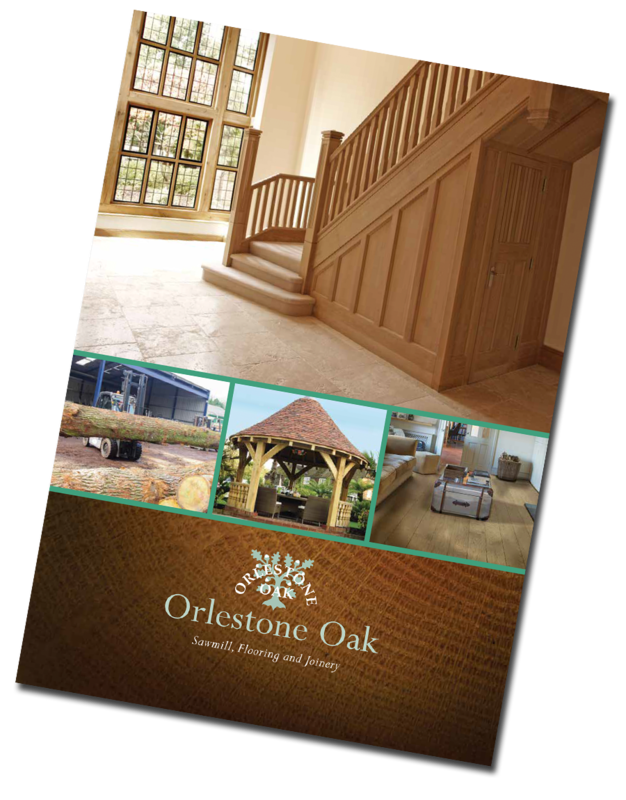 All products must be installed and maintained in accordance with Orlestone Oak instructions and guidelines. Failure to comply with the manufacturer instructions will render the warranty invalid. Terms and conditions of all manufacturers’ warranties are available on request. Deliveries will be made from receipt of payment and may also be dependent on cleared funds and products ordered and dates available. Delivery arrangements may be made for a certain date within business hours only (Mon to Fri). Other times may be arranged only by special appointment. 1) We offer roadside delivery only. It is worth considering where heavy goods are involved (beams and sleepers, also joinery) that you may require some help while the goods are been dropped. In some cases we can offer additional labor at an extra cost to be prior arranged. 2) At the time of ordering if there are any restricted access issues to your address and times that are not good such as school drop offs, please make us aware. 3) We are able to deliver in all areas including England the Channel Islands and the Continent. Please contact us for prices. 4) Collections in person are always welcome but should be arranged prior to arrival – Goods must be paid for in full when collecting. And a mutually convenient time must be agreed first in order that we may have them ready for your collection thus saving you time upon arrival. Our goods are heavy so vehicles should be designed to carry the weight intended. Goods being loaded into cars will be done so at your own risk. 5) Please ensure your contact information is correct and that there is at least one telephone number we may contact you on to finalise delivery arrangements. 7) We have no control in the weather when delivering; if a delivery is refused due to bad weather and we have already dispatched goods there will be a secondary delivery cost. This also applies to no one there to except deliveries. 8) Deliveries that are made on a pallet and which are delivered by a third party are normally left at curb side but if someone is there to help they can be pushed on the drive, some things need to be taken into account when taking in these deliveries such as no gravel drives narrow access whether it be roads to or narrow gate ways also level/flat drives. 9) Any damages or shortages should be reported to the driver at the time of delivery, we can not be held responsible after this time. 10) If when delivering and no one is found to be at the address after prior arrangement there may be additional delivery costs. 11) Please be aware deliveries are made using tail lifts and pump trucks. All new customers will be asked to pay a deposit at the time of ordering with the balance to be paid on collection or delivery. Please note that a 2% charge is made on all credit card transactions.